Adult specimen from Thailand in the aquarium. Juvenile from the UK aquarium trade. Wild specimen from Kalimantan Barat province, Indonesia (Borneo). This species is characterised by a dark spot on the caudal peduncle and rows of smaller dark markings on the lateral scale rows. apogon: from the Ancient Greek ἀ- (a-), meaning ‘without’, and πώγων (pōgōn), meaning ‘beard’, in reference to the absence of barbels in this species. Type locality is given simply as ‘Java, Indonesia’, but this species is currently understood to have an enormous natural range extending eastwards from Myanmar via Thailand, Laos, Cambodia as far as Vietnam and to the south through Peninsular Malaysia and into the Greater Sunda Islands of Borneo and Sumatra. It thus occurs throughout the Mekong, Mae Klong and Chao Phraya drainages as well as a host of smaller river basins, lakes and reservoirs. It is used as a food fish in some countries and may vary a little in colouration and patterning depending on collection locality. The precise extent to which it’s been artificially-introduced across this range is unclear. 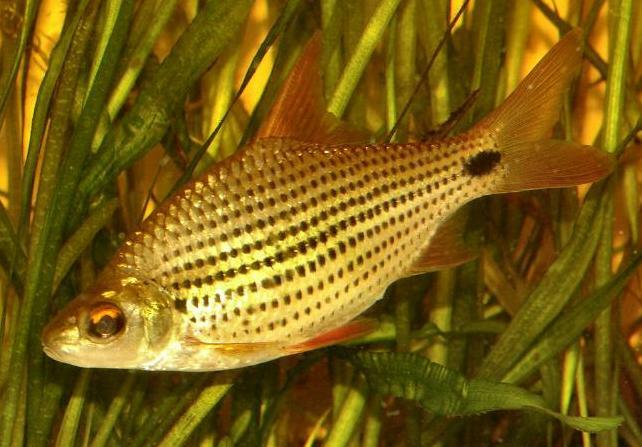 Primarily a riverine fish showing a preference for slower-moving or still zones including swamps, canals, and ditches, although it’s also been recorded in faster-flowing, rocky stretches and peat swamp forests. Submerged tree roots, branches and plants are favoured habitats as it grazes the rich biofilm that forms on such surfaces. It’s now also found inhabiting many artificial water bodies as a result of human interference; some populations have been deliberately introduced into new waters for aquaculture or angling purposes while others have had their habitat altered dramatically due to damming or agriculture. During the wet season it is known to move into inundated floodplains and forested. An example of a typical natural biotope is the Sungai Batang, a tributary of the Beris system in the state of Kedah, northern Peninsular Malaysia. Here the water is fairly shallow (<2m deep), moderately-flowing and the substrate composed of sand and pebbles with a covering of submerged wood and other debris. No aquatic plants are present although the river flows through a section of low-lying primary forest which presumably adds some shelter. C. apogon is found living alongside various species including Barbodes binotatus, B. lateristriga, Garra cambodgiensis, Devario regina, Homaloptera orthogoniata, Homalopteroides smithi, Laubuca laubuca, Crossocheilus oblongus, Glyptothorax major, Rasbora sumatrana and Mystacoleucus obtusirostris. An aquarium with base measurements of at least 180 ∗ 45 cm will be required for long-term care. Prefers a dimly-lit environment and a soft sand substrate is recommended. The addition of some good-sized pieces of driftwood will provide shady patches that will be appreciated. If you can’t find driftwood of the desired shape common beech or oak is safe to use if thoroughly dried and stripped of bark. While many aquatic plants will fail to thrive in such conditions species such as Microsorum, Taxiphyllum or perhaps some potted Cryptocorynes spp. should survive. 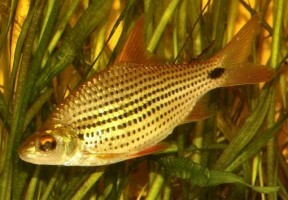 The broad-leaved species are ideal as this fish likes to graze them for food. A few patches of floating vegetation would also help to further diffuse the light entering the tank and provide a more natural feel. pH: Happy within the range 5.5 – 8.0 but a value close to neutral is usually recommended. In nature this species is primarily a micropredator grazing aufwuchs for small items including insects, crustaceans and the fry of other fish. For it to develop the best condition in the aquarium offer regular meals of small live and frozen foods such as bloodworm, Daphnia and Artemia along with good quality dried flakes and granules. An ideal resident of the larger, well-furnished community set-up though large adults may intimidate slow-moving or particularly timid companions. There are plenty of suitable tankmates, however, including many cyprinids, loaches, cichlids, catfish and characins. A community based around one of its native countries or river basins would also make a worthwhile project with some interesting alternatives (see ‘Habitat’). It is a gregarious species by nature and ideally should be kept in a group of at least six. 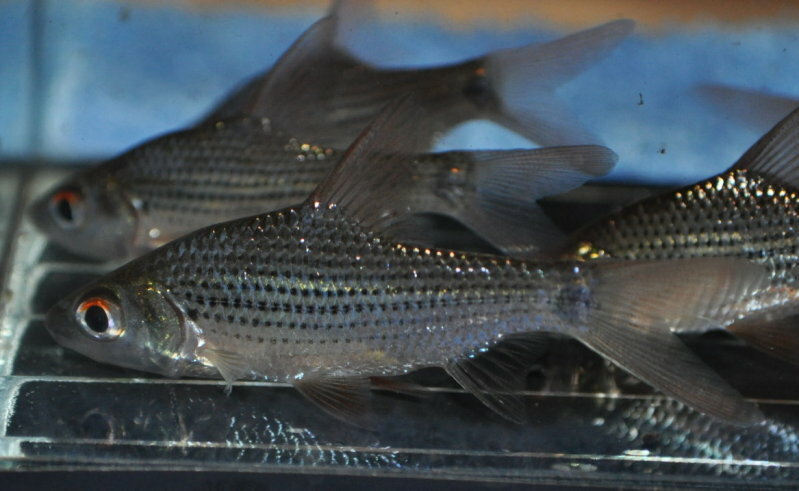 The fish display better colouration in the presence of conspecifics, are less nervous and the display on the whole will appear more natural-looking. Not thought to have been bred in aquaria to date. In nature it spawns in flooded zones towards the end of the wet season. 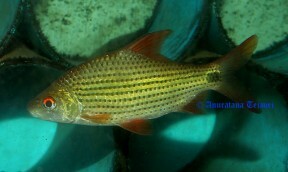 In the aquarium trade this species may also be seen on sale as ‘skinhead barb’. As with others in the genus little has been written regarding its captive care but it makes a peaceful and unusual addition to larger aquaria. The best way of obtaining it may be to keep an eye on shipments of wild fishes from Indochina and the Greater Sunda Islands as it’s rarely imported in large numbers and most often arrives as bycatch. It can be distinguished from congeners by lacking barbels, possessing a black blotch at the base of the caudal-fin, and rows of dark spots along the lateral scale rows. Members of Cyclocheilichthys are characterised by possessing a serrated dorsal fin spine, 9 branched pelvic fin rays, a conical snout, small, subterminal mouth and parallel rows of sensory folds on the snout and cheeks. 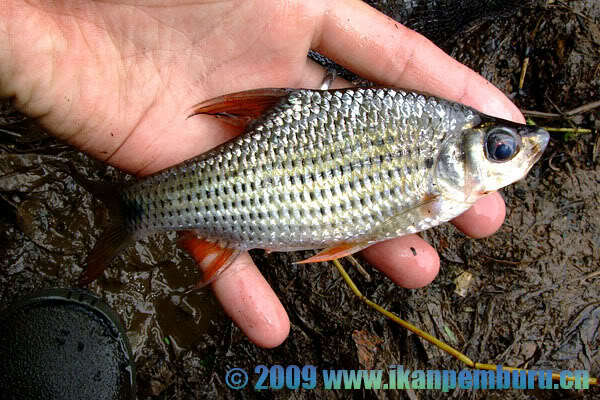 The latter feature is lacking in most other cyprinids but present in a few genera including Eirmotus, Oreichthys, Neobarynotus, plus a handful of other species. 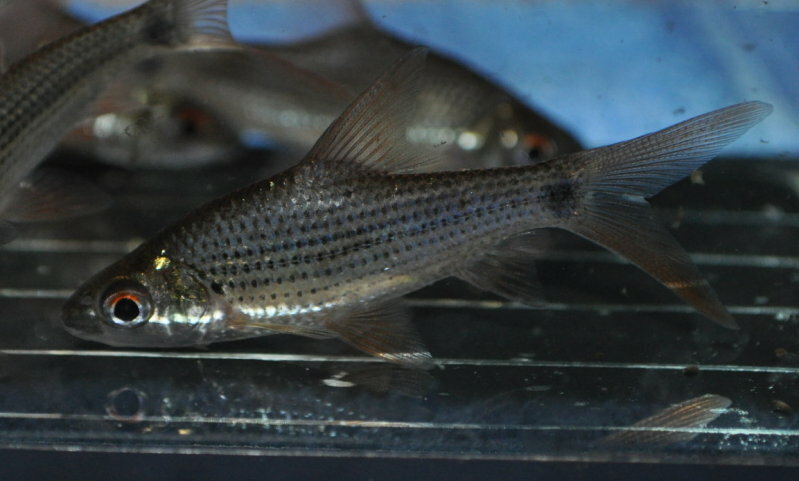 Given the extremely wide range exhibited by C. apogon, and taking into account patterns observed in other Southeast Asian fishes, it seems logical that this species may also turn out to represent a group of closely-related taxa. 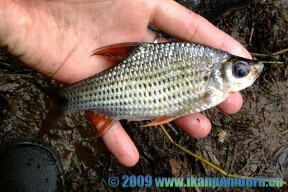 Cyclocheilichthys schoppeae, a new species of freshwater fish (Teleostei: Cyprinidae) from northern Palawan, Philippines.